Diet: We feed them LabDiet Monkey biscuits. We do all kinds of veggies, fruits, nuts, seeds, boiled eggs, occassionaly whole wheat bread. They also love Prima-Treats! Diet: Fresh spinach with eggs & olive oil, black olives, fresh mushrooms, chicken sticks, cooked yellow squash, fresh green beans, fresh sweet potatoes, pasta with cooked veggies, fruit gumivore fare (with marmoset diet, yogurt & fresh cranberries all put… into food processer). My babies eat pretty good! I fix 2 plates for them all 3 to share everyday but sometimes switch the veggies & add shrimp or a fish of some kind. Then of course I always give them meal or wax worms every day as well. Diet: I give her 3 bottles a day filled with milk (2%), baby food (2 jars), and monkey bisquits, blended together. She didn’t like it at first but is getting very used to it. She also gets tons of fresh veggies and fruits. She tries whatever I am eating but will not eat meat of any kind. Her favorite is spaggetti O’s. She loves them. I give her gummy vites and pedilite for her electrolytes. She seems to take it okay. The gummy vites are new and she loves them. They are low in Iron yet has all the essential vites for the day. You should try them at home as well. Diet: Fruit (bananas, apples, citrus, pears,etc), vegetables (carrots, potatoes, lettuce), commercial primate diet, nuts + put something new and interesting into diet everyday eg. Yoghurt occasionly. Sweets as a treat. They also enjoy warm calves milk. Diet: Both monkeys are spoiled,they eat whatever they see the wife and I are eating at the time. Usually Cooked pasta stuffed with cheese, orange slices, bread, monkey biscuits when we can get them to eat them (which is hardly ever), pizza, juices, apple and other fruits. Diet: eggs (hard boiled, scrambled), all vegetables, all fruits, nuts, whole wheat toast w/ small amount of honey, table onions, some yoghurt, monkey chow (loves it) hard or soaked in any kind of juice. grape nut ceral, rice cereal and cooked rice, there isn’t much Mikee does not eat, however if he could read a menu, I am sure I would have to print up a menu for him and let him make his choice. He does not like the same food everyday, I have to arrange his food to differ each day. I love him and if that’s how he wants his food than Mikee will get his food that way. After all, I don’t like the same menu everyday either. Diet: Vegetables (cooked or fresh), fresh fruit (banana, apple, grapes, mango…), Monkey Chow, and Anne LOVES Crown Royal, AND anything else that I eat except I try not to give it to her. (I know my diet is bad and I don’t want her to become like me :)) But it is tough sometimes to keep her out of the trash, and OUT OF MY DRINK!! Diet: she eats everything i eat and most of the time we eat together. I do watch her diet carefully and don’t allow her to have junk food (ie candy,soft drinks etc) which helps to keep me on a good diet myself. She does have her favorite goodies but i am very careful about her intake, i read all labels and try to keep her fat and salt intake to a minimum. I do try to feed her monkey chow but she will not eat it and just gives it to my parrot. She also eats dry dog food nuggets when she can convince my dogs to share. Diet: Yodas main diet is monkey biscuits, fruits and vegetables. He loves chocolate and gum. Dry cereal and mini marshmallows are his treats. Diet: apples, bannana, cucumber, carrots, mango, papaya, orange, plum, pear, grapes, hard boiled eggs, cheese, cat meat, bread soaked in honey, meal worms, crickets, marmoset jelly, sultanes, boiled rabbit meat, vitimin D3 once a week, marmoset breakfast (new world monkey pellets, (soaked), honey, vegetable mylupa all mixed in to dry slop) arabic gum, when they want it leaves. Diet: Primarily crickets, fresh and dried fruits (organic), meal worms, super worms. Occasionally plain rice, plain pasta, yogurt drops, scrambled eggs, kashi cereal. Diet: All recieve Mazuri Leaf Eater biscuits soaked except Spider Monkeys also receive them dry. All receive a mixture of every fruit and veggie you can imagine, without seeds. Marmosets receive yogurt, Marmoset diet and Marmoset Jelly in addition to F/Vs, and they LOVE beemoths!.. 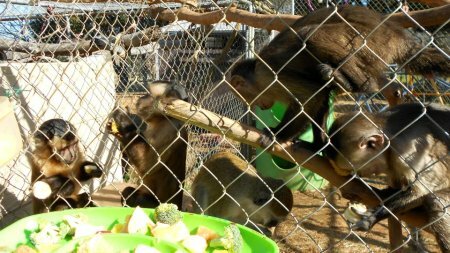 All receive canned Primate, and only Gibbons will eat greens. Every Friday, they all receive cereal, popcorn, small amount potato chips, raisins and other assorted treats. Diet: All eat monkey chow, and leaf eater pellets by Zupreem, occasionaly soaked in juice, Veggie mix with cooked carrots, corn, green beans, black eyed peas, cooked sweet potatoe, apple slices, oranges, red grapes, for variety we feed seasonal fruit and veggies, and the capuchin drinks isomeal am/pm. The lemur loves bananas and cranraisins (only a few) the squirrels love jumbo mealworms. For enrichment we spread seeds on the ground or hide it in boxes for them to find. Diet: Zupreem canned monkey food, Zupreem monkey biscuits, oranges (fresh and juice), bananas, chicken, ham, turkey, sweet potatoes, corn on the cob, sugar peas, apples, peaches, strawberries, plums, whole wheat rolls, almonds, hard boiled eggs in shell, blueberries, cucumbers, squash, carrots, kiwi, etc. She has fresh water available at all times and at night still takes a bottle of Isomil (soy based ) formula. Diet: Monkey chow!! A trail mix-dry cat food, dry dog food, nuts, sunflower seeds,dried fruit,cereals. Daily vitamin.Fruit & veggies. Egg occasionally,bread,pasta,rice,chese,chicken, yogurt..I try to vary their diet and keep it interesting. Diet: fresh fruit (grapes plumbs mango melon apple raisins kiwi fruit bannanna papia nuts & seeds), fresh and cooked vegetables, boiled and scrambled eggs, boiled ham, bread rice crispies. As a treat they like canned baby food. Diet: 3 fruits and 3 vegtables daily plus primate biscuits. A banana is always one of the three fruits. Sweet potatoes, kiwi, strawberries, corn on the cob and a rare treat of coconut are their very favorites. Tiny cups of jello or deluted frozen kool-aid are sometimes given for treats. We give as much variety as possible.